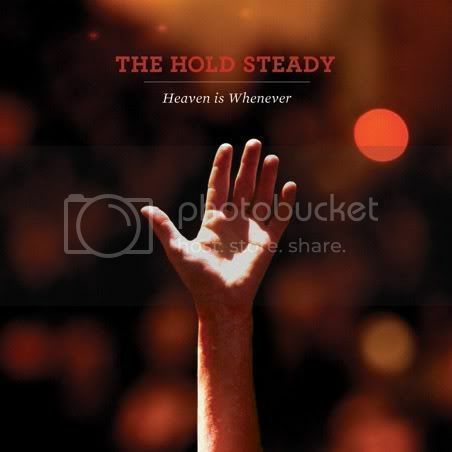 hearsoundswrite - A music blog out of South Carolina: Indie Music MAYhem Review 4: "Heaven Is Whenever"
The first thing you'll notice about Heaven Is Whenever, the Hold Steady's fifth studio album, is that Craig Finn is--are you sitting down?--singing. As any THS fan knows, Craig's trademark is a sort of quasi-melodic oration that focus a lot more on inflection and attitude than melody. But on Heaven, Finn is unmistakably singing. The only way I can describe it is kind of confusing at first. But soon, like a boiling jacuzzi, you settle into the new style and start paying attention to the music. Despite the loss of beloved keyboardist Franz Nicolay, the band sounds great. Look no further than "Sweet Part of the City", the loping slide-guitar anthem that kicks off the album. It's not nearly as explosive as "Constructive Summer" or "Stuck Between The Stations" as an opener, but it's a tonesetter nonetheless and provides what's sure to be a nice concert moment with the lyric "We want to play for you". We saw a flurry of early tracks in the months leading up to release, including "Hurricane J" and "Barely Breathing". The former starts as a sprightly bop with a pleasing "ooooh" chorus, slowing down a few BPM for the lyrics, which aren't exactly some of Finn's finest. The chorus reads like inspirational pop-punk hooey ("I don't want this to stop/I want you to know/I don't want you to settle/I want you to grow"). I'd just as soon switch over to "You Can Make Him Like You" from Boys and Girls in America which has a (vaguely) similar message, yet boasts a far more clever lyrical approach. "Barely Breathing" is vintage THS, a jagged bruiser recalling "Cattle and the Creeping Things" from Separation Sunday. Similarly reminding us that the band hasn't lost its edge is "The Smidge", the kind of song that puts their classic rock sensibilities on full display. "A Slight Discomfort" is seven minutes of the Hold Steady spreading its wings a bit, taking a chamber pop turn complete with pizzicato strings, piano runs, and spacious drum production. It's perfect as a closer, unfolding into a triumphal finale of guitar scrapes, soaring strings, and booming drum rolls. It's grander than anything THS have tried before, and I think they pulled it off nicely. Actually, you could apply that description to the entire album. Pros: While it isn't the purest example of a Hold Steady album, I think there's the right amount of experimentation mixed into the wheelhouse stuff that reeled us in in the first place. Cons: I don't hate the song, but I feel like "Hurricane J" is one of Craig Finn's weaker lyrical efforts.